Grace meets with Dr. Jordan, who has brought her a parsnip (trying unsuccessfully again to prompt her to think of a cellar). Grace tells Dr. Jordan she does not remember where she left off with her story, as a test to see if he has been listening. Dr. Jordan replies that Grace left off with Mary’s death, and Grace resumes her story. The fact that Grace once again pretends to not know something she actually knows shows how skilled she is at manipulating society’s low expectations of her. It also underscores the pleasure and pride Grace takes in finally having someone listen to her complete account of her experiences, showing the importance of storytelling in the formation and affirmation of self-identity. Because Mary has written a will, Grace is able to inherit her few possessions, many of which she sells to Jeremiah the peddler. Agnes helps Grace arrange Mary’s burial. After Mary is buried, Grace lays wildflowers on her grave every Sunday. The fact that Mary’s will is honored represents one of the few times in the novel that a woman successfully controls her own story. Grace’s devotion to Mary even after death symbolizes the love Grace has for her friend. Indeed, the fact that Grace takes flowers to Mary’s grave on Sundays further deepens this devotion by subtly linking it to a kind of religious ritual. Grace leaves the Parkinson house soon after Mary’s death, bouncing around from job to job. While she is working at the house of a Mr. Watson, Grace meets Nancy Montgomery, a childhood friend of Mr. Watson’s cook. Nancy tells Grace that she is housekeeper for a Mr. Thomas Kinnear, who lives in Richmond Hill, outside of Toronto. Nancy says she is in need of another servant, and she is also “lonely for some female company.” Though she does not fancy the idea of moving to the country, Grace accepts Nancy’s offer to wait a week before deciding whether she’s interested in the position. Later, Mr. Watson’s cook tells Grace she “[doesn’t] know if it [is] a suitable position for a young girl,” but refuses to elaborate. Grace, lonely for Mary and convinced that Nancy resembles her, decides to accept the position at Mr. Kinnear’s. The hint from Mr. Watson’s cook about the Kinnear household not being “suitable” is the first hint in the novel that there is something inherently subversive about Mr. Kinnear’s lifestyle. In fact, it turns out that Mr. Kinnear is known for seducing his servants and that he is currently treating his housekeeper, Nancy, as his mistress. Grace will have much to say about the propriety of this arrangement as the novel progresses. Grace’s decision to take the job at Mr. Kinnear’s is also noteworthy because it shows how bereft Grace feels without female friendship; in fact, this passage suggests that Nancy feels the same way. This makes the fact that Nancy and Grace’s relationship is destroyed by personal and class-based jealousies more tragic, because this passage hints wistfully that a different version of the story could have existed, in which Nancy and Grace actually became friends. Grimm, Alexandra. "Alias Grace Chapter 22." LitCharts. LitCharts LLC, 7 Feb 2018. Web. 18 Apr 2019. Grimm, Alexandra. "Alias Grace Chapter 22." LitCharts LLC, February 7, 2018. 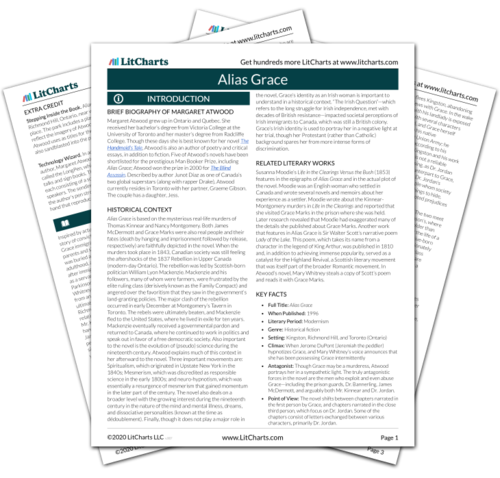 Retrieved April 18, 2019. https://www.litcharts.com/lit/alias-grace/chapter-22.